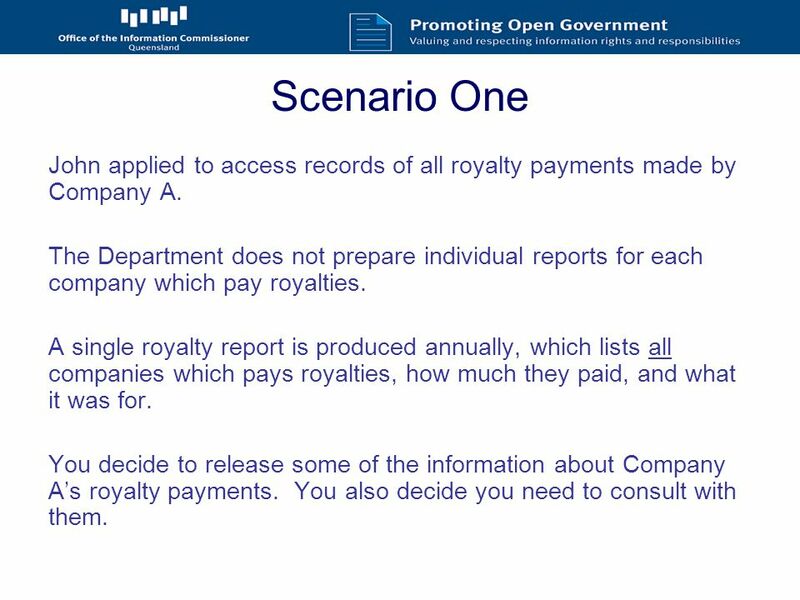 2 Scenario One John applied to access records of all royalty payments made by Company A. The Department does not prepare individual reports for each company which pay royalties. A single royalty report is produced annually, which lists all companies which pays royalties, how much they paid, and what it was for. You decide to release some of the information about Company A’s royalty payments. You also decide you need to consult with them. 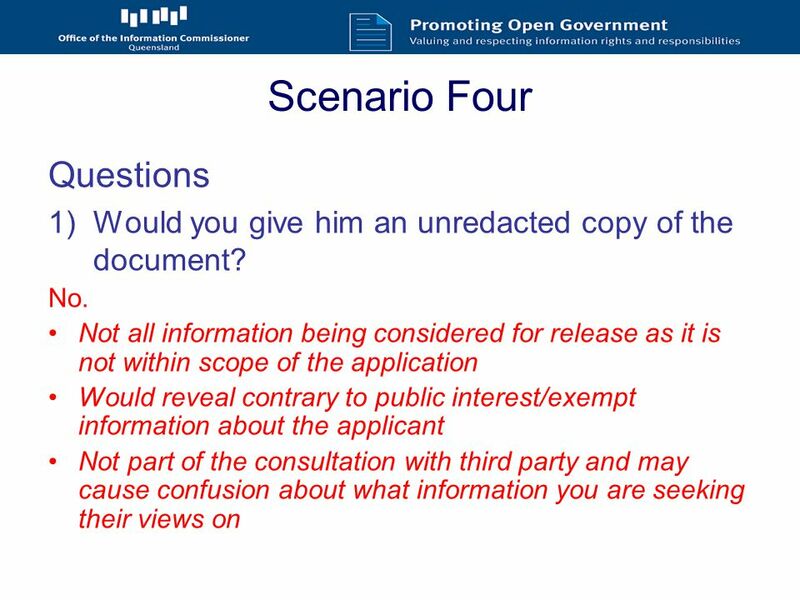 4 Scenario One Question 2: Presume you redacted the report before sending. If Company A demanded to see the rest of the report would you give it to them? 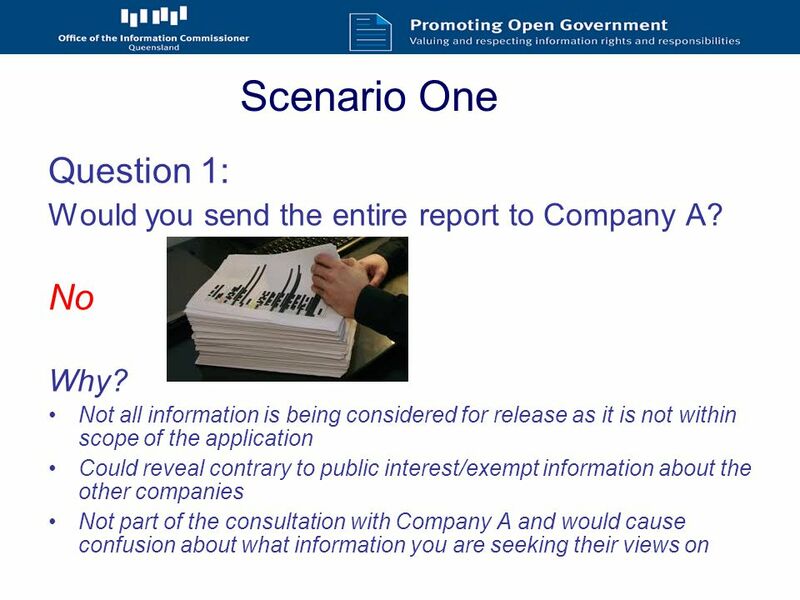 No – for the same reasons as the previous question Not all information being considered for release as it is not within scope of the application Could reveal contrary to public interest/exempt information about the other companies Company A has no right to view the additional information. 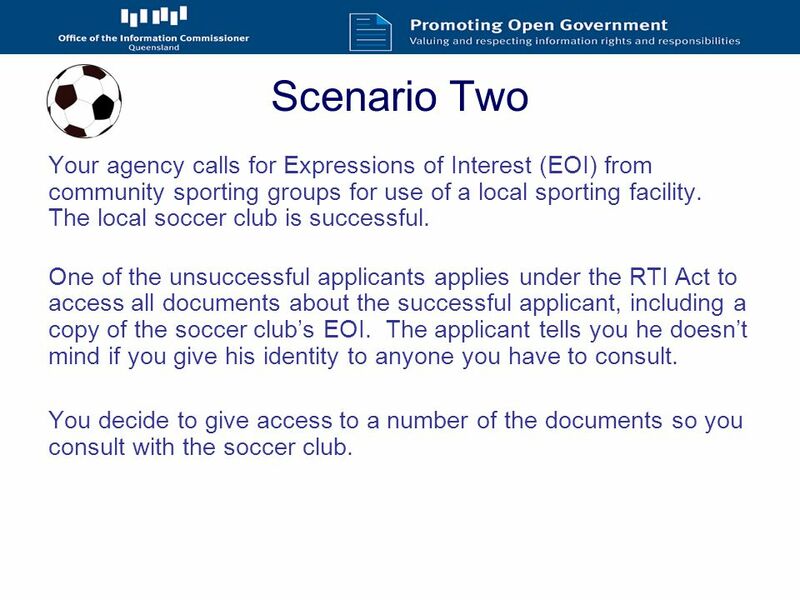 6 Scenario Two Your agency calls for Expressions of Interest (EOI) from community sporting groups for use of a local sporting facility. The local soccer club is successful. 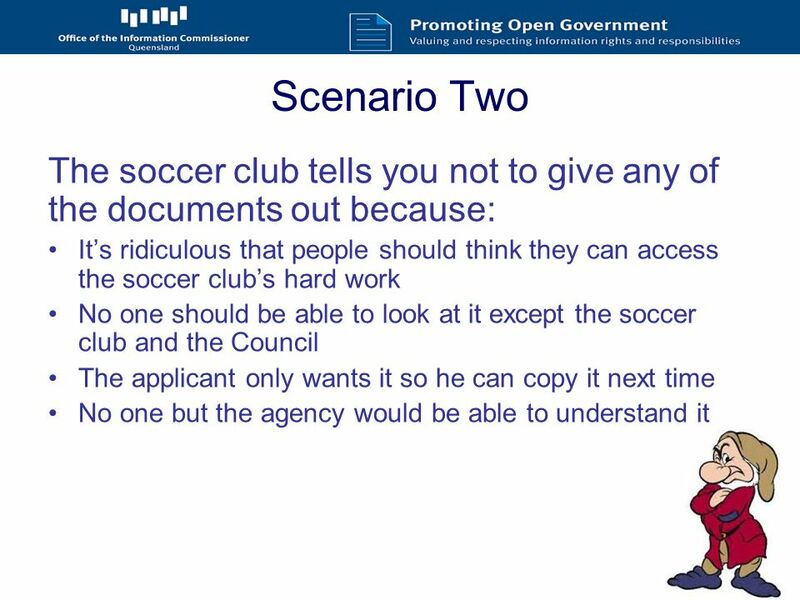 One of the unsuccessful applicants applies under the RTI Act to access all documents about the successful applicant, including a copy of the soccer club’s EOI. The applicant tells you he doesn’t mind if you give his identity to anyone you have to consult. 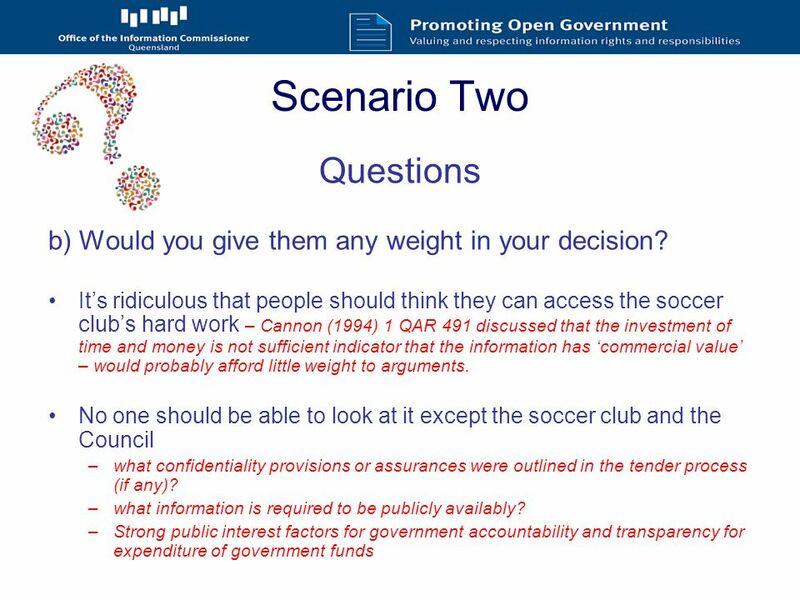 You decide to give access to a number of the documents so you consult with the soccer club. 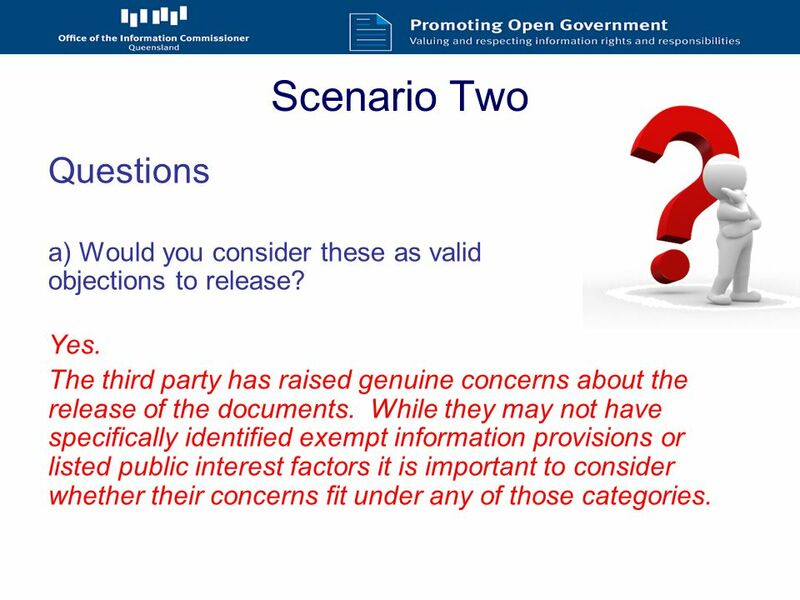 8 Scenario Two Questions a) Would you consider these as valid objections to release? Yes. The third party has raised genuine concerns about the release of the documents. While they may not have specifically identified exempt information provisions or listed public interest factors it is important to consider whether their concerns fit under any of those categories. 10 Scenario Two Questions (cont.) b) Would you give them any weight in your decision? The applicant only wants it so he can copy it next time – this is likely an irrelevant factor that needs to be considered and then disregarded (schedule 4, part 1, section 3 – mischievous conduct by the applicant). 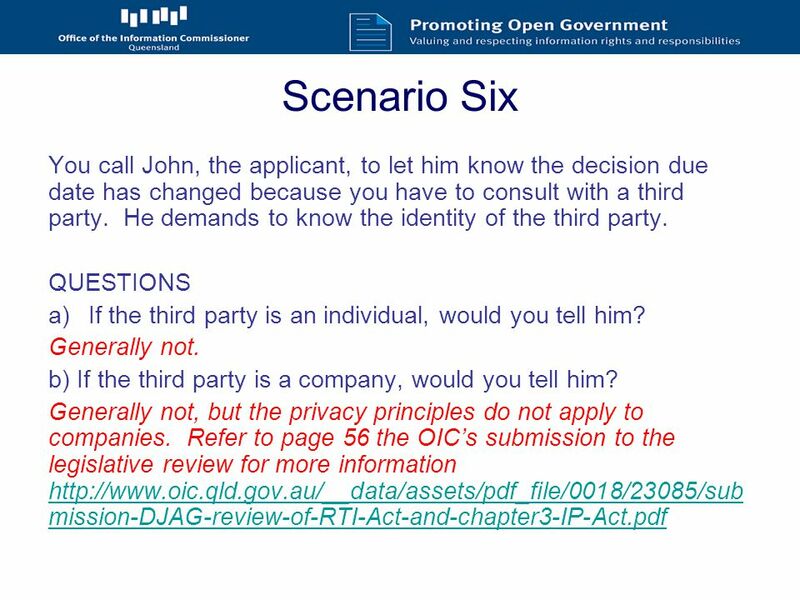 However, consider if there are any copyright considerations in terms of forms of access (not a public interest factor) No one but the agency would be able to understand it – irrelevant factor which needs to be considered and then disregarded (schedule 4, part 1, section 2 – could result in the applicant misinterpreting or misunderstanding the document). 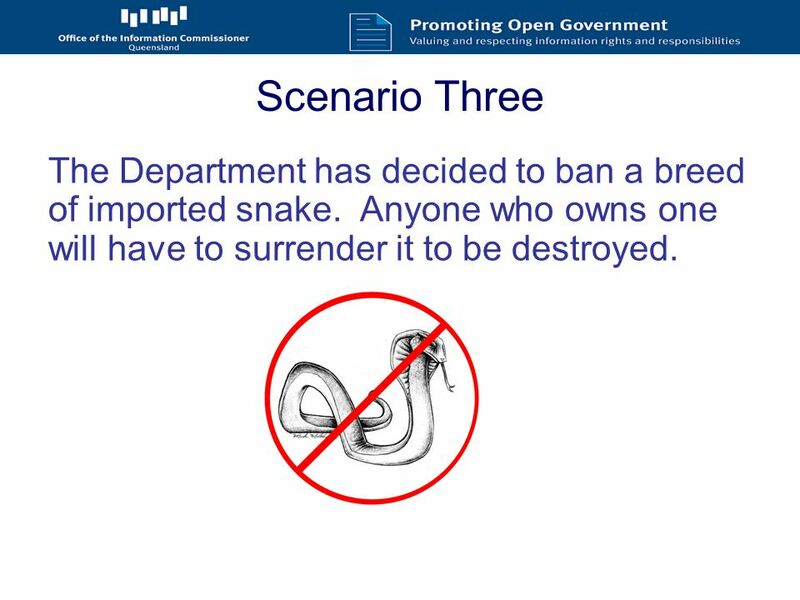 11 Scenario Three The Department has decided to ban a breed of imported snake. Anyone who owns one will have to surrender it to be destroyed. 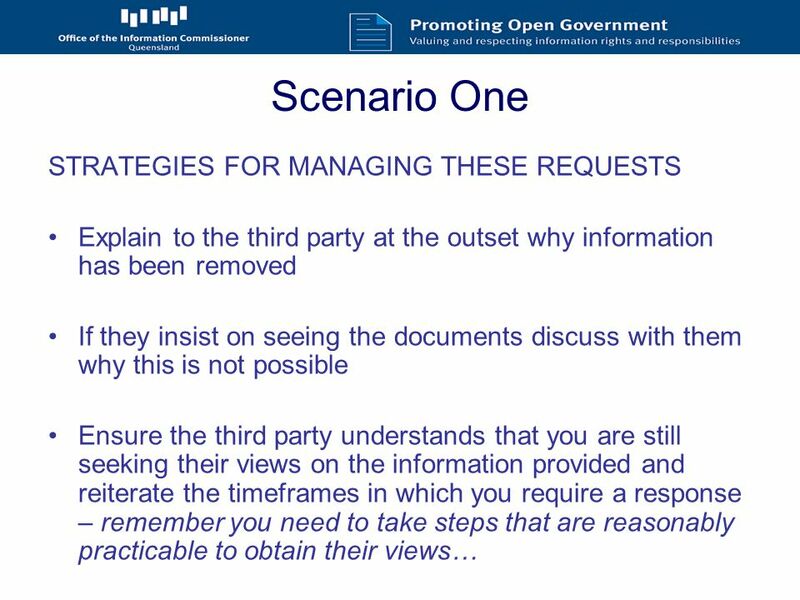 12 Scenario Three John applies to access all documents related to the Department’s decision. The scope includes the submissions. 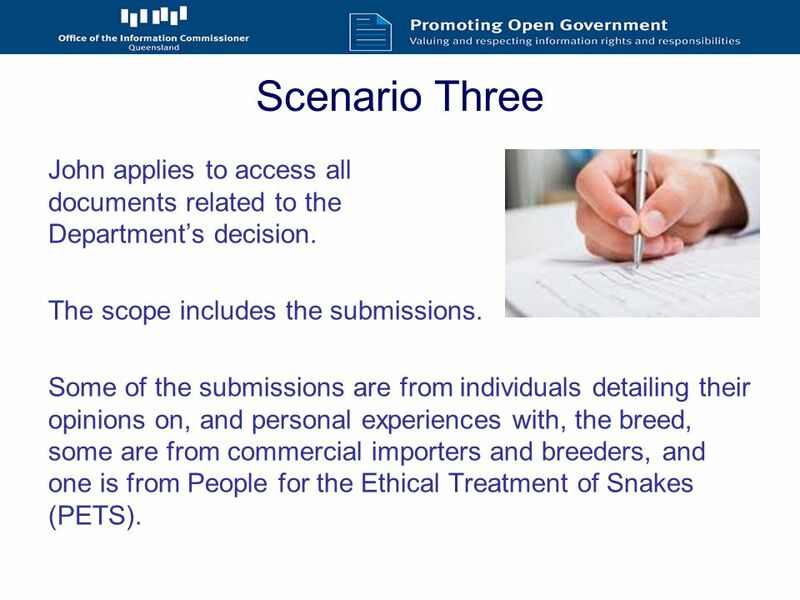 Some of the submissions are from individuals detailing their opinions on, and personal experiences with, the breed, some are from commercial importers and breeders, and one is from People for the Ethical Treatment of Snakes (PETS). 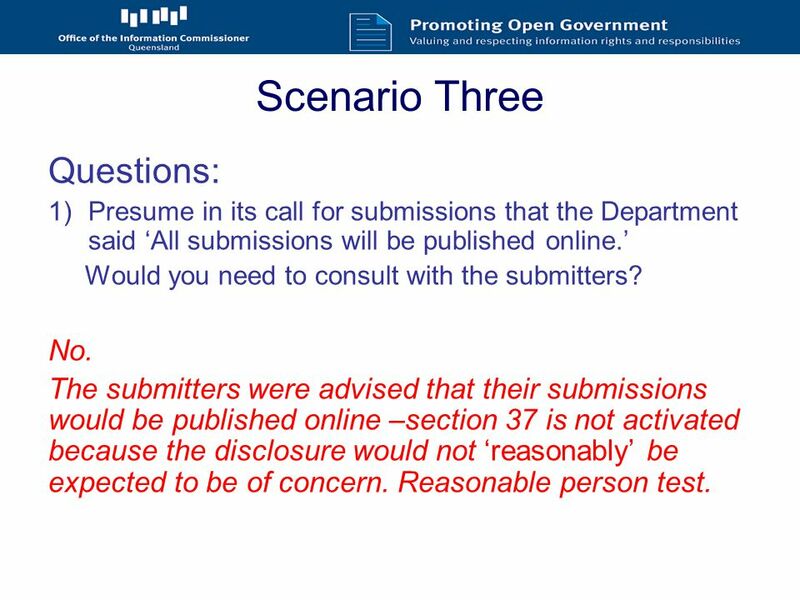 13 Scenario Three Questions: 1)Presume in its call for submissions that the Department said ‘All submissions will be published online.’ Would you need to consult with the submitters? No. The submitters were advised that their submissions would be published online –section 37 is not activated because the disclosure would not ‘reasonably’ be expected to be of concern. Reasonable person test. 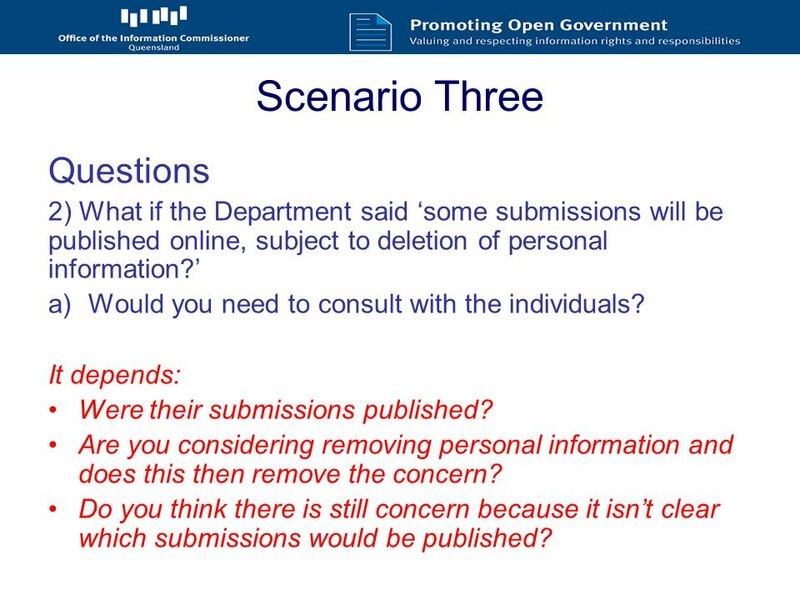 14 Scenario Three Questions 2) What if the Department said ‘some submissions will be published online, subject to deletion of personal information?’ a)Would you need to consult with the individuals? It depends: Were their submissions published? Are you considering removing personal information and does this then remove the concern? Do you think there is still concern because it isn’t clear which submissions would be published? 15 Scenario Three Questions 2) What if the Department said ‘ some submissions will be published online, subject to deletion of personal information?’ b) Would you need to consult with the breeders? It depends: Were their submissions published? Are you considering removing personal information and does this then remove the concern? Do you think there is still concern because it isn’t clear which submissions would be published? 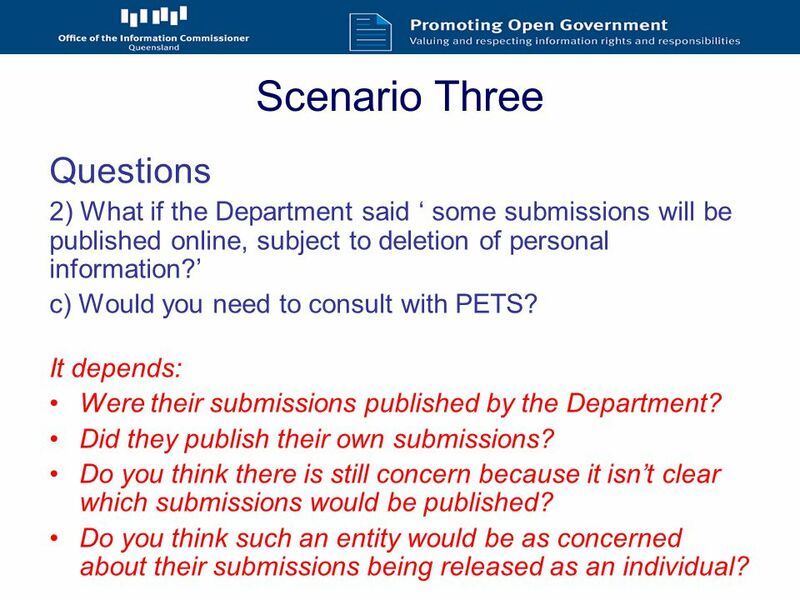 16 Scenario Three Questions 2) What if the Department said ‘ some submissions will be published online, subject to deletion of personal information?’ c) Would you need to consult with PETS? It depends: Were their submissions published by the Department? Did they publish their own submissions? Do you think there is still concern because it isn’t clear which submissions would be published? Do you think such an entity would be as concerned about their submissions being released as an individual? 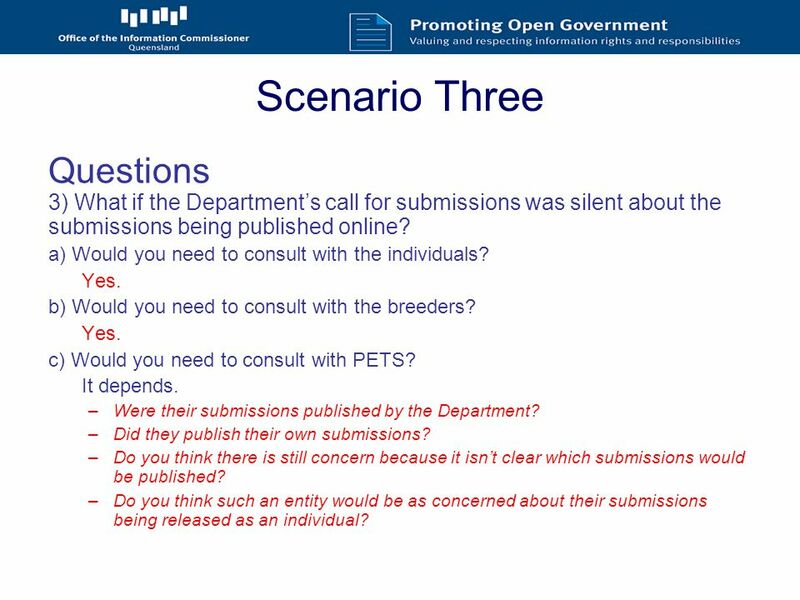 17 Scenario Three Questions 3) What if the Department’s call for submissions was silent about the submissions being published online? a) Would you need to consult with the individuals? Yes. b) Would you need to consult with the breeders? Yes. c) Would you need to consult with PETS? It depends. –Were their submissions published by the Department? –Did they publish their own submissions? –Do you think there is still concern because it isn’t clear which submissions would be published? –Do you think such an entity would be as concerned about their submissions being released as an individual? 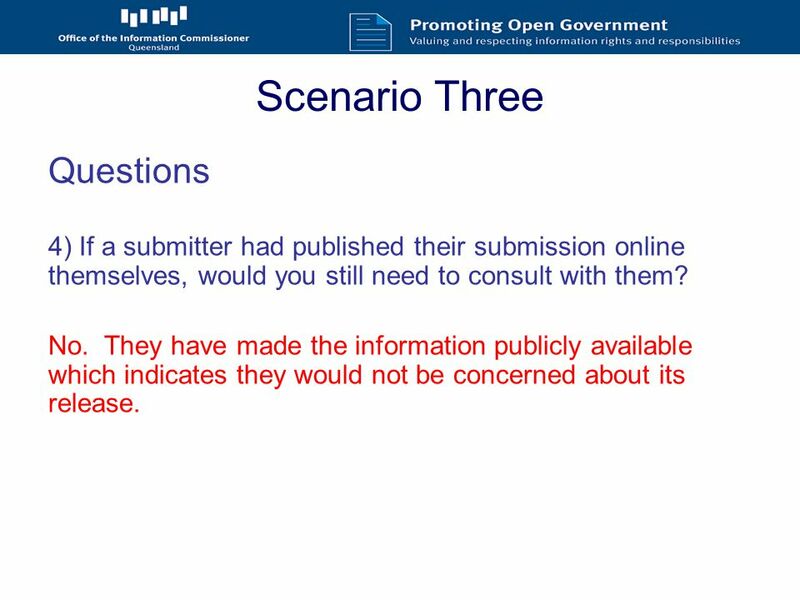 18 Scenario Three Questions 4) If a submitter had published their submission online themselves, would you still need to consult with them? No. They have made the information publicly available which indicates they would not be concerned about its release. 19 Scenario Four You consult with Alec as a third party. 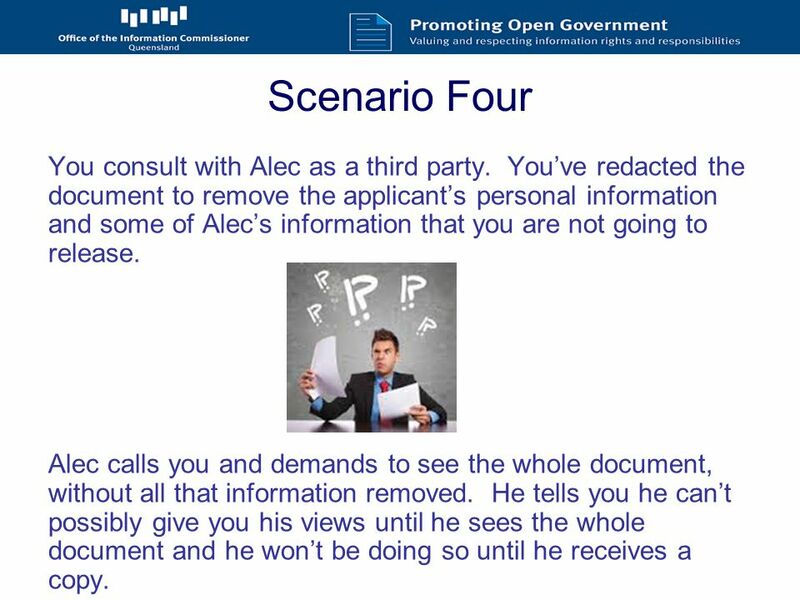 You’ve redacted the document to remove the applicant’s personal information and some of Alec’s information that you are not going to release. 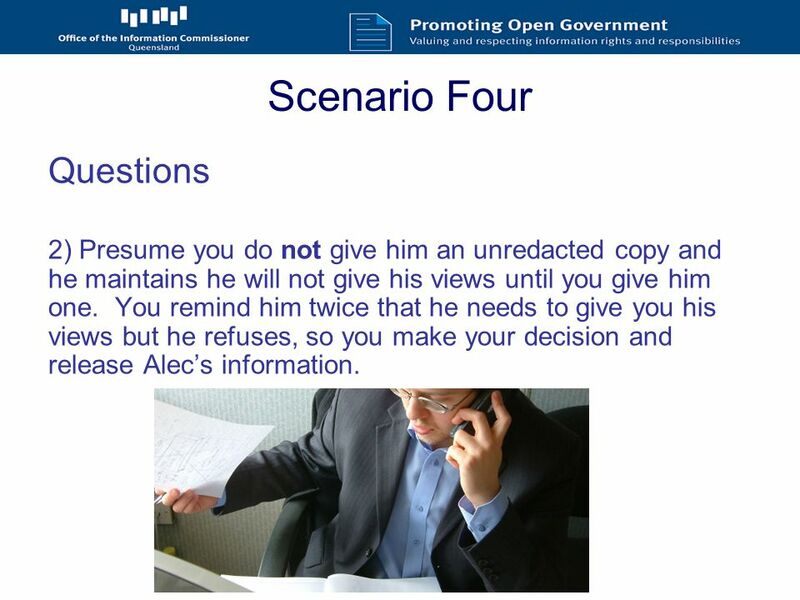 Alec calls you and demands to see the whole document, without all that information removed. He tells you he can’t possibly give you his views until he sees the whole document and he won’t be doing so until he receives a copy. 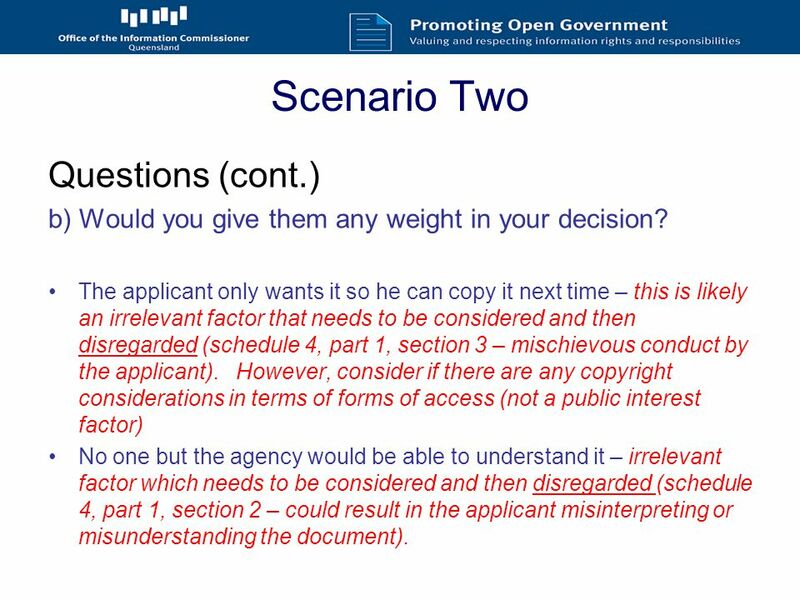 21 Scenario Four Questions 2) Presume you do not give him an unredacted copy and he maintains he will not give his views until you give him one. You remind him twice that he needs to give you his views but he refuses, so you make your decision and release Alec’s information. 22 Scenario Four Questions 2(a). Do you have to defer access? No. You have taken steps that are reasonable practicable to obtain the third parties views and they have declined to provide you with a response. If you have clearly explained the timeframes you have allowed, provided them with the relevant information for consultation and they do not respond then you can proceed to make your decision. Access is not deferred because your decision is not contrary to their view (because they have not provided any). 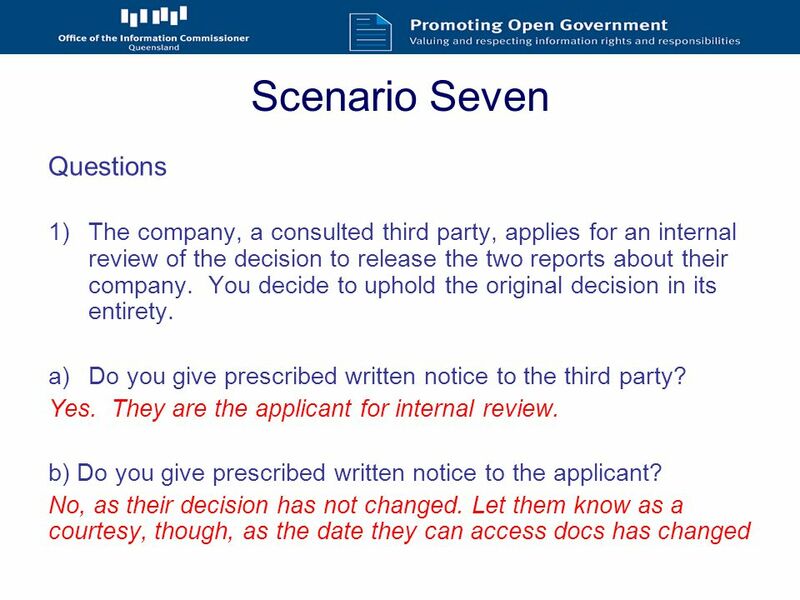 25 Scenario Seven The applicant applies for all reports about a company. 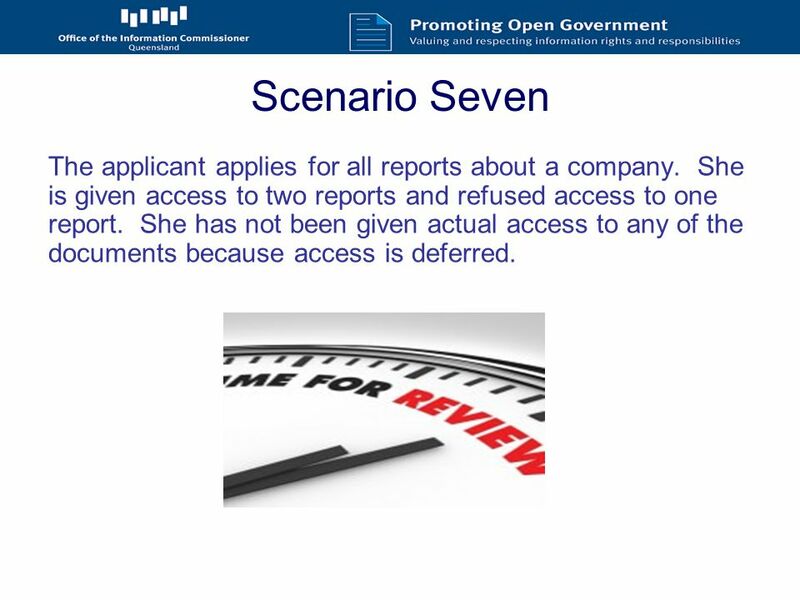 She is given access to two reports and refused access to one report. She has not been given actual access to any of the documents because access is deferred. 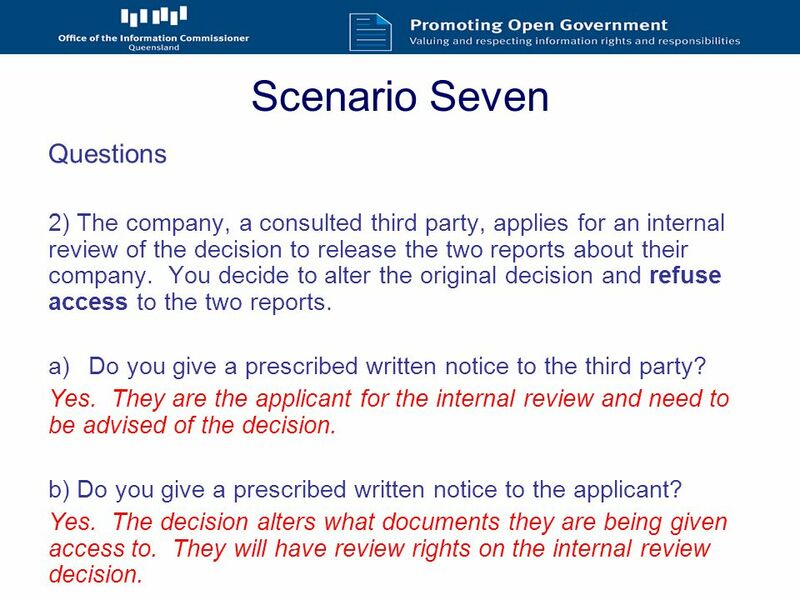 27 Scenario Seven Questions 2) The company, a consulted third party, applies for an internal review of the decision to release the two reports about their company. You decide to alter the original decision and refuse access to the two reports. a)Do you give a prescribed written notice to the third party? Yes. They are the applicant for the internal review and need to be advised of the decision. b) Do you give a prescribed written notice to the applicant? Yes. The decision alters what documents they are being given access to. They will have review rights on the internal review decision. 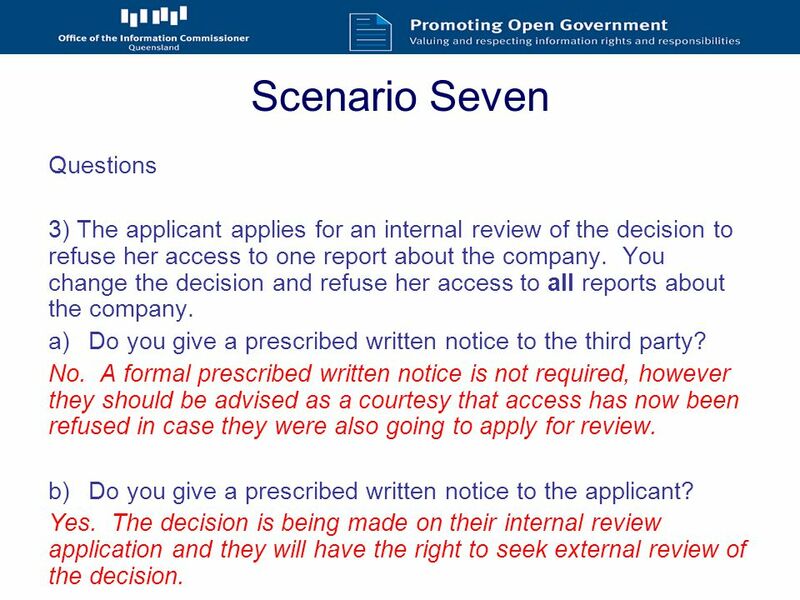 28 Scenario Seven Questions 3) The applicant applies for an internal review of the decision to refuse her access to one report about the company. You change the decision and refuse her access to all reports about the company. a)Do you give a prescribed written notice to the third party? No. A formal prescribed written notice is not required, however they should be advised as a courtesy that access has now been refused in case they were also going to apply for review. b)Do you give a prescribed written notice to the applicant? Yes. The decision is being made on their internal review application and they will have the right to seek external review of the decision. Download ppt "Topic: Consulting with a third party Duration: approx. 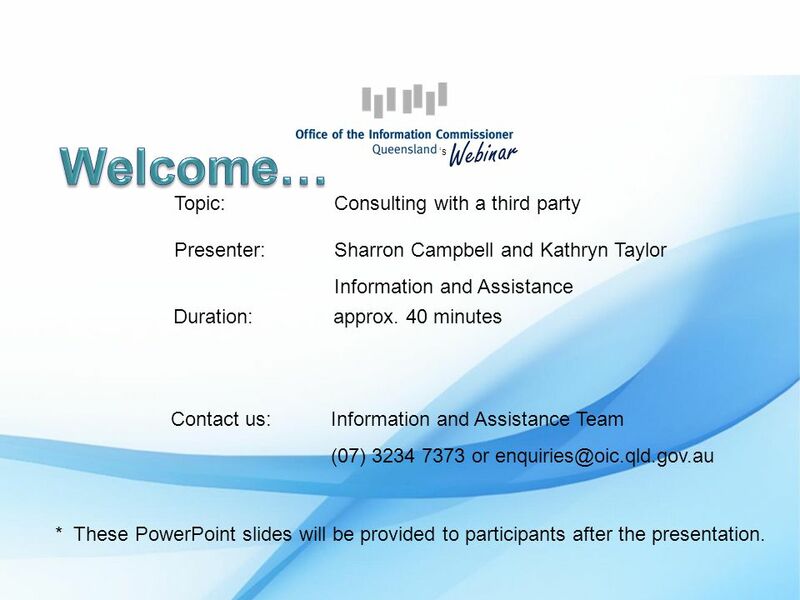 40 minutes Presenter: Sharron Campbell and Kathryn Taylor Information and Assistance Contact us:"
Lifecycle of a Freedom of Information (FOI) request – corporate or business information. Educationeducation Improving Scottish HM Inspectorate of Education Schools (Consultation) (Scotland) Act 2010 HMIe Briefing 2011. 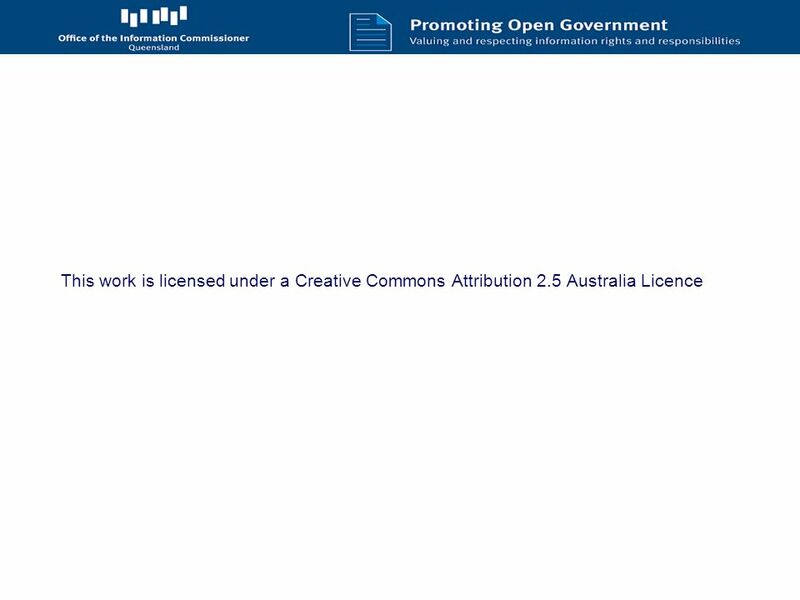 IP in Government Contracts Under the Whole of Victorian Government Intellectual Property Policy. Electronic theses and copyright Janet Aucock Head of Repository services March 2014. Student Integrity and Misconduct October 2011 Student Integrity and Misconduct Training for Administrative Staff supporting the Misconduct Process. 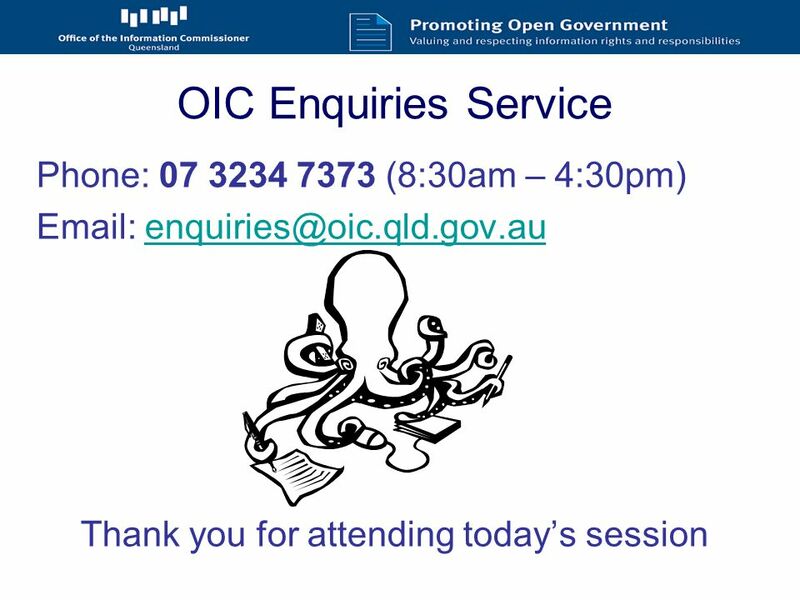 Openness and Transparency in Local Governments and Smaller Organizations June 5, 2014.
Letters of Recommendation A Practical Guide for Obtaining Effective References. CONDUCTING INTERVIEWS Preparing for your documentary. OSEP QUARTERLY CALL WITH PARENT CENTERS PART B FINAL REGULATIONS RELATED TO PARENTAL CONSENT FOR THE USE OF PUBLIC BENEFITS OR INSURANCE Office of Special. FOFA Where are we at. FOFA Refresher BEST INTERESTS DUTY Advisers will be required to act in the best interests of their retail clients and place their. 2/16/2010 The Family Educational Records and Privacy Act.